Native American agriculture was often a sophisticated response to a challenging environment. What were the secrets of permaculture, companion cropping and corn farming? Could these techniques contribute to modern farming? 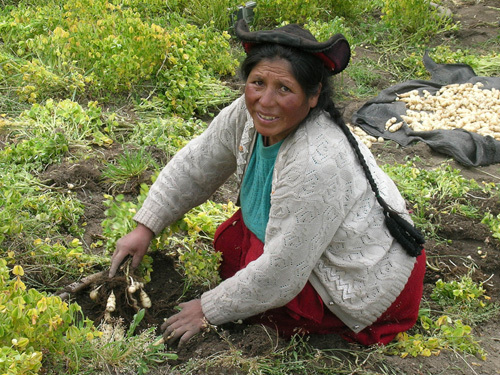 A woman in Peru’s highlands harvests oca, the white tubers in her hand. What factors have caused the decline of traditional agriculture? Are they all irreversible? What is the major reason why conventional plows cause soil erosion? Perennial cultivation uses plants that do not have to be replanted each year. What are some examples of perennial plants used in today’s agriculture? What is the rationale for growing the “three sisters” (corn, beans and squash) in combination? Discuss: What agricultural products are associated with your own culture, and what makes them important? Draw leaves of beans, corn, and squash. In terms of the structure of the veins in the leaves, which plant stands alone? Look up “monocot” and “dicot” on the web. Which of these three plants are monocots, and which are dicots? On a map, locate upstate New York, the Lakota Sioux reservation in the Dakotas, and the Kwakwaka’wakw homeland in British Columbia. What does the map tell you about their environments? How would the environment influence agricultural practices?